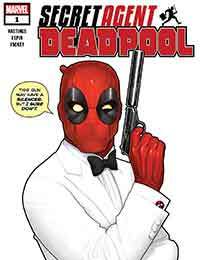 Deadpool: Secret Agent Deadpool Average 0.00/5 - out of 0 total votes. It's a case of mistaken identity when Wade Wilson, the regeneratin' degenerate you know as DEADPOOL, kills an American superspy on a mission to stop the deadly terrorist agency called GORGON! Now, it's up to Wade to complete his victim's mission as only he can – with excessive violence, an accelerated healing factor, and maybe, just maybe, a few laughs along the way. Part of the comiXology Originals line of exclusive digital content only available on comiXology and Kindle. This title will be available as part of comiXology Unlimited at release.